Lukas Geniusas was born in 1990 in Moscow. He started piano studies at 5 at the preparatory department of F. Chopin Music College in Moscow, a school he went on to graduate with top honors in 2008.
the Silver Medal at the 16th Chopin International Piano Competition in Warsaw in October 2010. 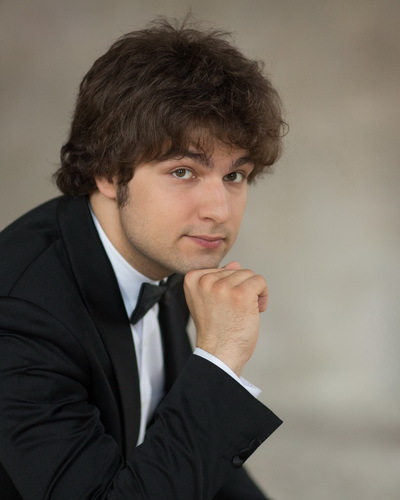 Lukas Geniusas has been a recipient of Grants from both Vladimir Spivakov Foundation and Mstislav Rostropovich Foundation, and has been a regular participant of The New Names Foundation Concerts. Lukas has been awarded federal grants of The Russian Federation "Young Talents" (2005) and "The Gifted Youth of XXI century" (2007). Lukas has appeared with numerous orchestras including the Symphonies of Hamburg and Duisburg in Germany, BBC Scottish Symphony, Kremerata Baltica, Katowice Radio, Warsaw Philharmonic and collaborated with an outstanding musicians of nowadays such as Gidon Kremer, Andrey Boreyko, Saulius Sondeckis, Dmitry Sitkovetsky, Antoni Wit, Roman Kofman, Dmitry Liss and others. Lukas has travelled to France, Italy, Spain, Austria, Poland, Lithuania, Japan, South Korea, USA, Germany and has performed in such a prominent events as Duszniki Zdroj, Rheingau, Ruhr and Lockenhaus Music Festivals. Lukas Geniusas has an extensive repertoire that ranges from Baroque to works of modern composers. Lukas is an avid chamber music performer: taking part in duets, trios, quintets, he's very inquisitive when it comes to new works by modern composers as well as rarely performed repertoire. «Музыка звезд» (Кисловодск) - 13 ноября 2009, 20 ноября 2010, 10 ноября 2013 г., концерт в рамках фестиваля «В гостях у Ларисы Гергиевой» Владикавказ (14 июня 2013).